21. 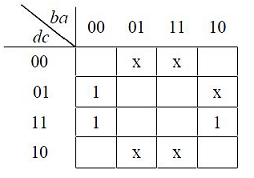 Consider the Karnaugh map given below, where X represents “don’t care” and blank represents 0. 23. 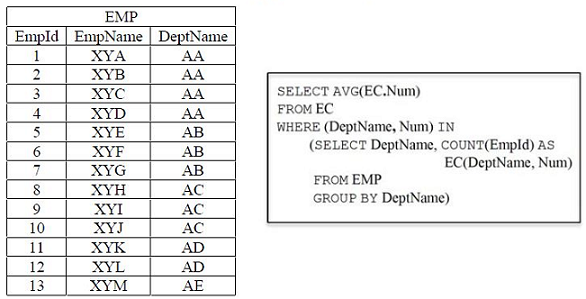 Consider a database that has the relation schema EMP (EmpId, EmpName, and DeptName). An instance of the schema EMP and a SQL query on it are given below. If the pre-emptive shortest remaining time first scheduling algorithm is used to schedule the processes, then the average waiting time across all processes is ................... milliseconds. (I) Minimum Spanning Tree of G is always unique. (II) Shortest path between any two vertices of G is always unique. Which of the above statements is/are necessarily true? (C) always TRUE when p is FALSE. (D) always TRUE when q is TRUE. 30. Let u and v be two vectors in R2 whose Euclidean norms satisfy ||u|| = 2||v||. What is the value of α such that w = u + αv bisects the angle between u and v?